An unidentified crew member participates in a NASA Extreme Environment Mission Operations (NEEMO) mission. Plenty of astronauts practice spacewalks in the water, but a crew currently living in an underwater lab plans to introduce a surprising twist to its aquatic excursions: They will create a 10-minute communications delay with Mission Control, simulating what speaking with people on Earth could be like in deep space. 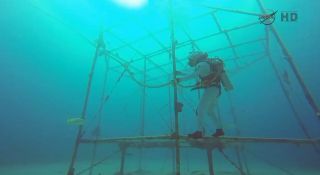 The four astronauts participating in the nine-day NASA Extreme Environment Mission Operations (NEEMO) 18 mission will perform underwater "spacewalks" in which they pretend to be on an asteroid far from Earth, where radio communications between the two locales would take minutes, not seconds, as communication from the International Space Station does. "We'll be testing out those tools if we did go to an asteroid," said Jeanette Epps, a NASA astronaut who is part of the NEEMO 18 crew. NASA officials hope to send astronauts to an asteroid robotically pulled into orbit around the moon sometime in the mid-2020s. Epps spoke to members of the press from 62 feet (19 meters) underwater in the Aquarius lab off the coast of Key Largo, Florida. NASA astronaut Mark Vande Hei, Japanese astronaut Akihiko Hoshide and European Space Agency astronaut Thomas Pesquet are also living and working in the lab. Although the mission is a simulation, malfunctions do occur sometimes. Communications problems between the "spacewalkers" and Mission Control affected operations earlier in the mission, said Vande Hei. "Thomas and I were supposed to spend the entire time doing experiments, while Aki and Jeannette were doing the spacewalk, but because of the communications problems, I had to abort my science," he said. "Thomas went ahead and did them all, which was great, and I focused on the spacewalks." There are many similarities to space in this confined environment, ranging from the need to balance science tasks with maintenance tasks, to living together in close quarters, to having the time tightly scheduled, the astronauts noted. There is also significant international collaboration, with astronauts from three partner agencies working together this time in the NEEMO 18 crew. When asked by a journalist how space relations are with Russia amid the Ukraine crisis, the astronauts emphasized all was well and that working together is required in space. "I hope the future holds a lot of cooperation," Vande Hei said. "The fact we have an international program to explore space has helped us keep the program going between administrators, and regardless of what is going on politically." The NEEMO 18 crew participates in a news conference from the Aquarius underwater lab, just off the coast of Key Largo, Florida. From left, European Space Agency astronaut Thomas Pesquet, Japanese astronaut Akihiko Hoshide and NASA astronauts Mark Vande Hei and Jeanette Epps. The experiments astronauts are doing during the mission, which began Monday (July 21), range from the physical to the behavioral. For example, each of the crew members sports a sensor that records how close the crew members work with each other inside the school-bus-size habitat. Communications with NEEMO Mission Control is usually constant, and there is the ability to send items to and from the habitat as needed. Also living inside the habitat are two support staff who are assisting with Aquarius maintenance and systems, as required. The crew members also have Internet and phone service to talk with family and friends.